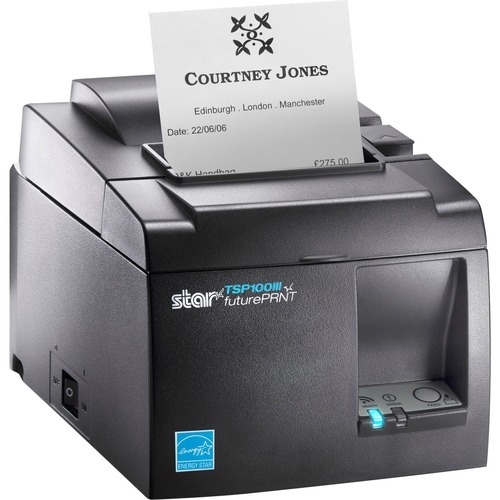 The TSP143III is the faster, easier, and better POS printing solution. Already a leading player in the mPOS market, Star Micronics' TSP143III is offered with WLAN, LAN, Bluetooth, or USB interface connection for an easy-to-use and ready-to-go installation. The TSP143III now offers a web configuration page for the WLAN and LAN TSP143III printers, a simpler wat for all devices to connect to the WLAN printer for set-up with AP mode, an easy Bluetooth pairing connection, and a "plug and play" USB connection.With included internal power supply, power cables, complete mounting kits, and paper roll, the TSP100III is the perfect printer for any mPOS bundle. Star has also added an additional USB type A connector for one convenient power source for your tablet or mobile device. The TSP100III prints at a high-speed of 43 RPM (250mm/s) and includes "drop-in & print" paper loading and a guillotine auto-cutter. Combined with its powerful futurePRNT Windows software, users can enhance their printed receipts to add graphics (logos and coupons), print multiple copies, or use the text processing function to replace printed information or trigger a coupon, and much, much more. The TSP100III can also be used with Star Micronics AllReceipts„¢ digital receipt app, allowing shoppers to manage their receipts digitally, and retailers to receive instant feedback on customer satisfaction. Marketing Information: Star Micronics is proud to introduce the newest addition to the TSP100III series, the faster, easier, and better TSP100IIIU printer. As the first of its kind, the TSP100IIIU only requires one lightning cable for iOS users to facilitate data communication and device charging. The TSP100IIIU also offers a simple "plug and play" USB connection for Android, Windows, Mac, and Linux users as well.